Dubai, UAE, September 05, 2018: Top Sharjah officials and heads of various government entities and departments who met Wednesday to discuss the recent tragic accidents of children falling off high-rise buildings emphasised that a number of effective and innovative measures have been taken in partnership with all stakeholders to deal with the problem. They reaffirmed their commitment to enforcing all possible safety and security standards in high-rise buildings and residential units in the Emirate according to highest global standards, calling for a public-private partnership to deal with the problem and prevent such tragedies in the future. The meeting was presided over by HE Thabit Al Turaifi, Director General of Sharjah City Municipality and attended by HE Afaf Al Marri, Chairperson of Sharjah Social Services Department, Brigadier General Mohammad Rashid Bayat, Director General of Police Operations at Sharjah Police, Col Sami Al Naqbi, Director General of Sharjah Civil Defence, , HE Tariq Saeed Allay, Director of Sharjah Government Media Bureau, HE Hassan Yaqoub Al Mansouri, Secretary General of Sharjah Media Council and Eng Khalid Mohammed Al Ali, Secretary General of Sharjah Urban Planning Council, among others. 'We are keen to find radical solutions to the problem of accidents involving children in high-rise buildings in coordination and partnership with government agencies to safeguard the safety of the community, which is one of our priorities in the Emirate of Sharjah,' said HE Thabit Al Turaifi, Director General of Sharjah City Municipality. Since 2017, the Municipality has developed preventive solutions to curb these accidents and made a series of amendments to technical requirements of windows and balconies. The amendments obligated landlords and contractors to raise the height of windows and balconies to 120 cm, instead of one metre, as was previously permitted. They required the installation of safety locks to prevent windows from opening for more than 5-10 cm. Landlords and contractors were also obliged to use railings that children cannot climb over. Last year, the Municipality allowed tenants of residential apartments to put up a translucent acrylic barrier on their balcony railings after obtaining the necessary permit, said Al Turaifi. On this occasion, a detailed presentation was made highlighting the problem of accidents involving children in high-rise buildings and the various laws and safety norms that have been introduced by the authorities or have been in place all these years. According to the data, negligence by parents and presence of furniture and various objects in balconies and near windows or open windows are the main causes of accidents involving children. It is worth mentioning that the Sharjah Municipality conducted a massive awareness campaign titled ‘Safety of Our Children is Our Responsibility' from June 1, 2017 to March 1, 2018 in Arabic, English and Urdu, in partnership with Sharjah Police, Sharjah Civil Defence, Sharjah Urban Planning Council and Sharjah Prevention and Safety Authority etc. The campaign was aimed at achieving the target of zero accidents and it produced significant results, bringing down the number of accidents to just one so far this year. The campaign targeted all Sharjah residents, especially those living in commercial areas, and landlords and real estate firms. Speaking on the occasion, HE Tariq Saeed Allay, Director of Sharjah Government Media Bureau stressed the need for concerted efforts between various Sharjah government entities and the media to avoid future media crises. He pointed out that a rapid response leads to limiting the spread of the crisis and preventing rumours and negative news, pointing to the important role of social media as a first step in tackling such a phenomenon that may adversely affect society. Allay underscored the importance of community awareness to avoid accidents involving children. He pointed out that the protection of children's lives is not only an individual responsibility but the responsibility of the community and it rests with everyone. 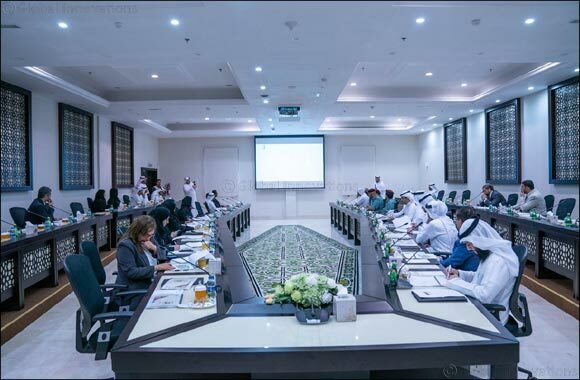 He noted the key role the media and government communication departments could play in promoting this message and outreach, in cooperation with the concerned authorities. The officials urged families in the Emirate to take greater care to protect children at home and not leave them unaccompanied in balconies or near windows endangering their lives. Col Sami Al Naqbi, Director General of Sharjah Civil Defence, cautioned families in the Emirate against leaving children unaccompanied in balconies and near windows in residential buildings, especially in high-rise apartments. “Children must not be left anywhere near windows or balconies unaccompanied by parents or adult family members under any circumstances in order to avoid tragic incidents of children falling off high-rise buildings,” he said. He also urged residents to immediately report to building management if they notice any fault in window locks or balconies in the interest of their children's safety. The authorities have been continuously monitoring all neighbourhoods and residential buildings in the Emirate to ensure they adhere to highest safety norms to protect precious human lives and properties of all residents.